Netent draws inspiration from 20th century Art Nouveau, inspired by natural forms and structures, as it merges style with features which include Fortune Re-Spins, Fortune Wins and free spins. This masterpiece employs artwork that exudes golden opulence and symbols the work together to reward up to 80,000 coins! If you’ve ever been to Barcelona, then you’ve surely feasted your eyes upon La Sagrada Familia by Antonio Gaudi, which is undoubtedly one of the finest examples of the avant-garde. The slot embraces geometric patterns into the design of its symbols. At the high end, we start with artistic images of a lion, owl, turtle, fish and shell. These symbols precede the A, K, Q and J poker symbols. The complementary soundtrack is equally inspiring. The Fortune Wins Feature is a five-level coin-win game, with each level consisting of five steps or tiers which increase in value with each step for up to x2,000. When triggering the Fortune Re-Spins or free spins features, you start in the lowest step, one. By collecting instances of a particular symbol in sufficient quantities, called the collectable symbol, a meter is filled enabling you to climb the steps. If a key symbol should happen to land on a space, then you level up, which increases the value of the coin wins at each step. 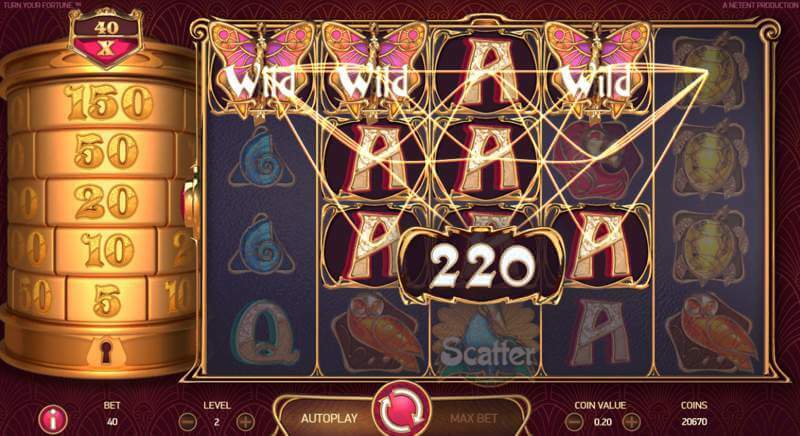 It is possible to trigger the Fortune Re-Spins with Fortune Wins in the base game with two scatter symbols surfacing on one of the odd number reels in conjunction with a payline win. The winning symbol becomes the collectable symbol, and you are awarded a re-spin for the chance to add to the meter, which fills up and elevates you a step after five symbols are collected. Re-Spins continue provided you keep adding collectable symbols and remember the appearance of a key symbol will increase you a level. The free spins feature in combination with Fortune Wins is triggered by three scatters symbols during the base game. Should you land all three scatters in conjunction with a payline win then you also unlock the Fortune Wins Feature. Before commencing with the free spins, a three-tier free spins wheel will randomly determine the number of free spins, collectable symbol and your initial Fortune Wins level. You can collect between 7 and 13 free spins, and can start on level 2, 3 or 4 for the Fortune Win. You step up with ten collectable symbols and to help you out; there is a way of filling the meter by 10 when a +10 collectable symbol pops up on the second reel. Recall that the key symbol will level you up. 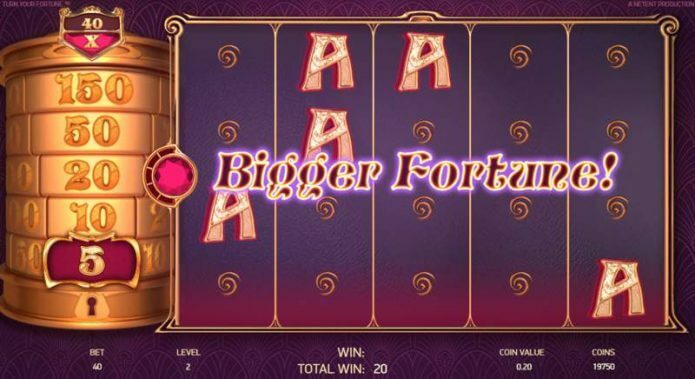 Turn Your Fortune slot was designed with desktop, tablet and mobile in mind so while you can play it at home or office, you can also take it anywhere with wifi access using an Android or iOS device. This slot game has a return to player of 96.24% and allows wager variations ranging from 0.20 to 200. The Fortune Wins Feature is a five-level coin-win game, with each level consisting of five steps or tiers which increase in value with each step for up to x2,000.